So, Watts Up With That uses this image along with an article delineating the excuses given so far for the 'Pause' and failures of the inaccurate climate models. The list currently stands at a 10-count. But it's very likely to go higher in the near future, no? #1. Leading government climate "experts" put it all down as "coincidence"
Now this list provides overwhelming evidence that consensus climate scientists and major government climate agencies agree this extended 'Pause' took place and continues. Yet despite this scientific agreement, there are still those fanatical GWNs who continue to push the jihad of anti-science, scaremongering propaganda ... along with an overabundance of extremist threats. The never predicted 'Pause' has no equal as the chart on the left begins to suggest. This chart is a plot of total temperature anomaly differences (i.e. total monthly change, month by month) since February 1998 through December 2013. NOAA's year-end 2013 published monthly temperature dataset has identified February 1998 as the highest temperature anomaly month ever. And as the chart indicates, for the subsequent 190 months, that 1998 peak was never topped, despite an average 29.5 billion new tons of CO2 emissions per year over that time span. Since the modern era beginning with the 1950s, that 190-month stretch is the longest uninterrupted "pause" - simply, this is unprecedented since the era of vast consumer/industrial CO2 emissions commenced. In contrast, the earlier 190-month period ending February 1998 experienced an almost continuous climb of higher and higher temperature changes, culminating in the early 1998 peak. This steady climb was supposedly the sole result of the growth of new CO2 emissions (this periods emissions actually averaged some 30% less than the subsequent 190-month period ending in 2013). Thinking the pre-1998 warming phase was of permanent nature, not transient, the consensus climate "experts," and their sophisticated climate models, predicted this steady warming trend would just drone on year after year, as far as the mind could speculate. And like so many experts in so many other science fields, the IPCC climate wonks were wrong, spectacularly. It now stands at 190 months of prediction failure! Surprised? If yes, review previous of 'those-stubborn-facts' charts here and here. Note: How calculations were done: For the 190 months ending December 2013 (left chart), the February 1998 anomaly was the base point. The anomaly difference from this base was calculated for each subsequent month. No calculated difference during the 190 months was greater than -0.0001. Similar difference calculations were made for the 190-month period ending February 1998 (see rightmost chart), with that period's base point being April 1982. Download NOAA 2013 year-end global monthly dataset used for difference calculations and plots (NOAA changes all historical data points for each new month's dataset, so 'C3' will retain this 2013 dataset for the near future). CO2 emission dataset can be downloaded here. Don't know how to chart in Excel? It's easy. Go here to learn how. Over recent decades, there have been many false claims, misrepresentations and untruths regarding climate change and global warming. Unfortunately, these deceptions are commonly void of any empirical merit, pernicious in nature and stubbornly deep-seated, often held dear by the world's establishment elites. 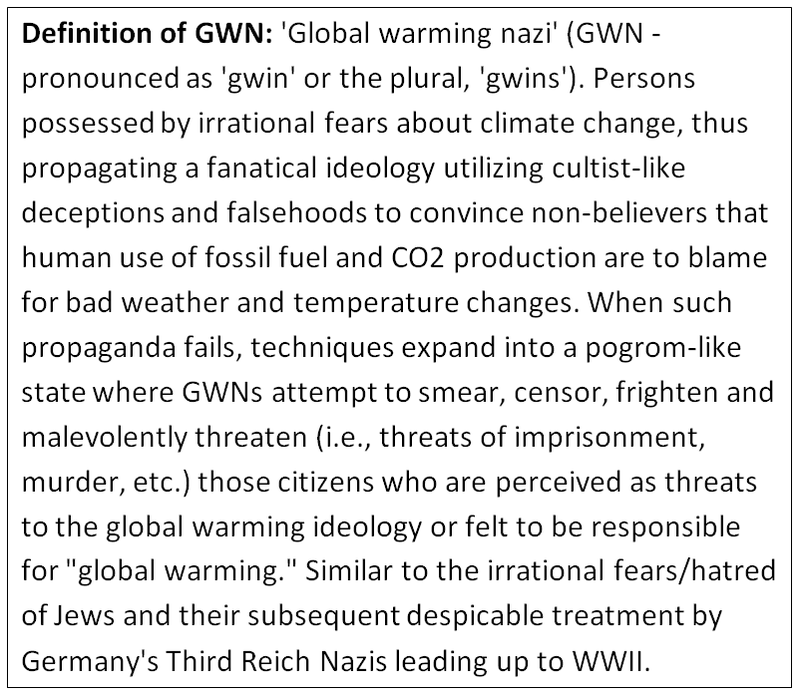 Typical of false claims held dear include: global warming is "accelerating"; "runaway" global warming is at a "tipping point"; and that the greenhouse gas CO2 is a "control knob" or "thermostat" for Earth's climate. With an air of authority and trust, agenda-driven, white-coat scientists can make these fictions sound entirely plausible, especially to the incredibly gullible establishment elites. However, these falsehoods rarely can survive even the simplest climate 'factchecks,' which apparently are beyond the intellectual capabilities of most elites. Using the UK's HadCRUT4 global temperature dataset and NOAA's datasets for CO2, one can plot the per century warming/cooling trends on a monthly basis going back to 1850. Utilizing the easy-to-use plotting and calculation tools of Microsoft's Excel, it is simple to compare the empirical temperature trends of climate reality with the growth of atmospheric CO2 levels. What do these empirical climate records actually reveal? ===> The greatest warming (acceleration) trends ever recorded took place during the 1870s; the largest cooling trends occurred during the late 1870s and early 1880s. ===> Simply put (which is blatantly obvious from the empirical evidence), human CO2 emissions or total CO2 atmospheric levels are not the "control knob"/"thermostat" that the white-coat, agenda-driven scientists say they can manipulate to manage the globe's temperatures. Download datasets used to calculate the 12-month, 24-month, 36-month, 60-month and 120-month trends and plots. Don't know how to chart in Excel? It's easy. Go here to learn how. The climate "consensus" experts are no longer able to deny the climate reality of the unexpected global warming stall over the last 15+ years. Recently, the peer reviewed journal Nature took a stab at explaining 'The Hiatus' by ultimately suggesting that the Pacific Decadal Oscillation shift to cooling was to blame. Other IPCC consensus "experts" are wildly throwing around a hodgepodge of reasons that at last count was up to eight. Take your pick. One reason definitely not on the table for discussion by climate reality deniers resisters is the obvious one: increasing CO2 levels are having little impact on global temperatures, which means that nature's normal climate forces overwhelm any CO2 influence. For the consensus scientists to open this can-of-worms would be the death knell of the AGW hypothesis - scientists driven by greed and the limelight do not willingly eviscerate the golden ox that has produced multi-billions for research grants and scientific studies. Yet, when scientists examine the empirical temperature measurement datasets, it becomes readily apparent that changes in CO2 levels are not generating the expected changes in global temperatures, as predicted by the immensely powerful and sophisticated (and incredibly costly) climate models. This obvious climate reality is portrayed in the above chart. Literally, 3-year changes in CO2 levels have no correlation with 3-year changes in global temperatures for the IPCC's modern era, starting with 1950. Simply put, one does not have to be a rocket scientist, nor a climate scientist, to ascertain that the CO2-centric AGW hypothesis is severely dysfunctional. Eventually, global warming phase will return, as it always has in the past, but the climate models' prediction outcomes (and credibility) will likely be even worse, if that is even possible. Additional temperature and climate charts from the realm of those-stubborn-facts. Download datasets used to calculate 3-year changes, correlation, trends and etc. using Excel. Don't know how to chart in Excel? It's easy. Go here to learn how. Humans are constantly faced with natural disasters, year after year. Disasters have nothing to do with the witches of CO2 casting spells. The following is a partial list of 1954 "climate change" disasters, au natural, from 60 years ago. 1954: "New York In Grip Of Blizzard"
1954: "NINE DEATHS IN COAST-TO-COAST STORM Plains Swept by Snow and Blizzard"
Additional "climate change" disaster from the past - also known as extreme, severe weather incidents.